The quiet serenity of the season's first snowfall is awesome to behold. 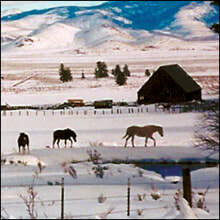 Snowmobiling, snowshoeing, and cross country skiing are popular winter sports here. When snowfall is plentiful, the Johnson ski area provides great fun for family and friends. However, if the larger ski resorts are your choice, plan on Northstar, Incline, Slide Mt., Sugar Bowl, Tahoe Donner, Squaw Valley, Alpine Meadows, Kirkwood, and more. 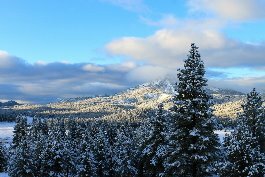 Traveling time is a quick 1 to 1 1/2 hours away from the Truckee Tahoe areas.